What if I told you that Google+ hashtags are way more than meets the eye? Why Google+ Hashtags are different from hashtags on any other social networks. 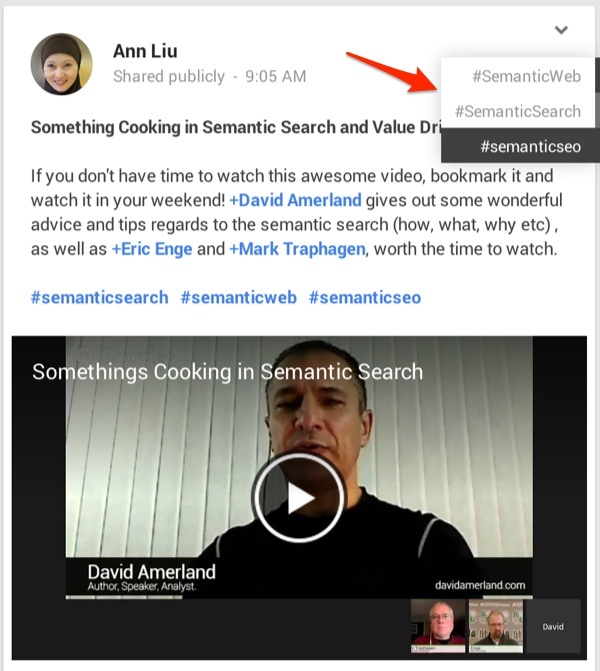 What Google+ Auto-Hashtags are and what they reveal about Google's move toward semantic search. What Google+'s new Explore tab is and how it works. How new hashtags enter Google+'s database. What you can do with what you've learned about Google+ hashtags! Ready? Take the leap down to start learning! On the surface, Google+ hashtags look much the same as they do on other social networks. Just as you would on Twitter or Facebook, you construct a hashtag in a Google+ post or comment by typing the pound (aka number) sign "#" followed immediately by the text you want for the hashtag. The hashtag must be all one-word, with no spaces. Once you publish your post or comment, the hashtag becomes a clickable link. Clicking on a hashtag now takes you to the new Explore tab, which I'll discuss below. We see the real magic of what Google+ does with hashtags, and the beginning of how they are used more powerfully there than on other social networks, in Google+'s ability to auto-create hashtags. If you add your own hashtags to a post, Google+ will display up to three of them in the upper right corner of the post on desktop Google+. Initially, one is visible, but hovering your mouse over that one will reveal the others. But what happens if you don't add any of your own hashtags? If your post has a sufficient amount of text, Google+ will often identify main keywords within the text and convert them into hashtags, which are then displayed at the upper right of your post, just as your own hashtags would be. 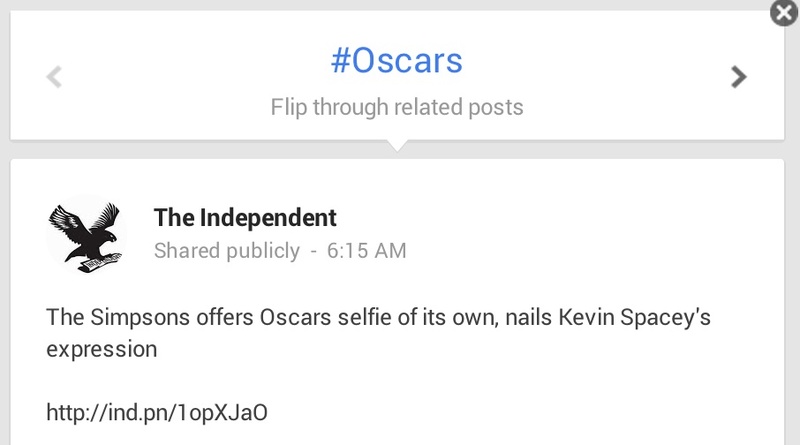 Notice in the example above that the post creator had added no hashtags, yet Google+ displays two at upper right. Also notice that one of those hashtags (#Oscars) is being drawn not from the post text but from the title of the linked post! 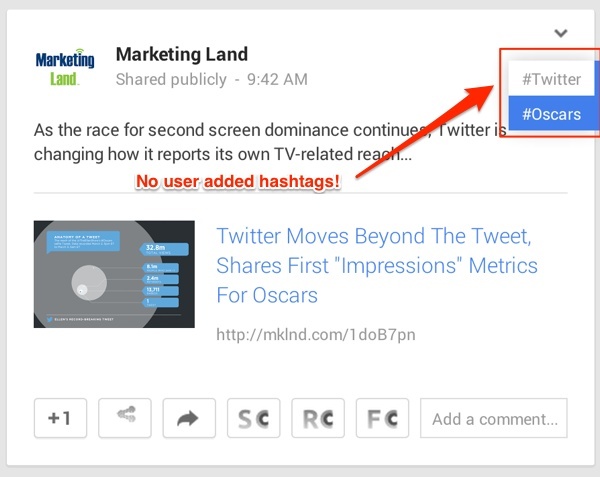 If you click one of the hashtags displayed at upper right on a post, Google+ flips the post card over, and shows you a "slide show" of posts related to that hashtag. After you flip through several related posts, the final "slide" displays related hashtags. Keep those in mind. We haven't seen the last of them! Last month US Google+ users began to see a new tab at the top of their home pages: Explore. Explore is Google+'s new headquarters for exploring content via hashtags, including related hashtags. A listing of up to 20 hashtags related to the one searched. A collection of content tagged with the searched hashtag, and/or any of the related hashtags. Now we get to the interesting part. 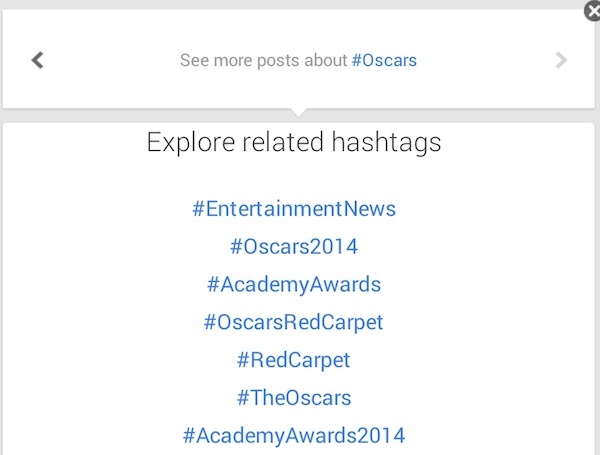 How are related hashtags created, and how do they get, well, related? When the Explore tab came out, some of us noticed that certain people's names as hashtags (such as #marktraphagen ) generated both associated posts and related hashtags in Explore. At first we thought maybe Google+ was auto-generating such tags for everyone, but we soon discovered that some people got related tags and/or content, and others didn't. Martin Shervington has been collecting the hashtag data for dozens of profile names for a couple of weeks now. Some names have up to 20 tags, some just a few, while others none at all. How Does a Hashtag Become a Related Hashtag? I had a hypothesis that these hashtags were not auto-generated, but had to be "earned" by people using them on posts in conjunction with other hashtags. My idea was that a certain number of posts within a certain time had to use a hashtag for Google to think it significant enough to show related hashtags. Then one Friday night I got my opportunity to test that hypothesis. On that Friday evening, Eric Enge was showing 0 related hashtags in Explore. If you put #ericenge in Explore, you would get five pieces of content, but no related hashtags. All five of the displayed posts had used #ericenge, but they were spaced out over many months, going back to last October. 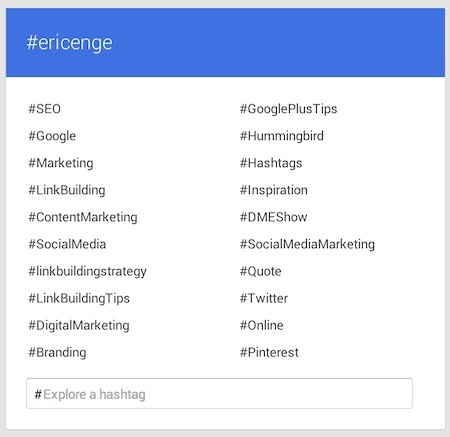 So that night I shared an older post of Eric's about Google Hummingbird and used#ericenge and a few relevant hashtags on it. A few people reshared that post. By the way, when a hashtag earns that status, it also starts showing in the auto suggests for hashtags. Now when I type #erice, at that point I get auto-suggested #ericenge. So...on Google+ users create the hashtag database and help establish what tags will be related. But Google doesn't confine it hashtag magic to just text. Photos get to play as well. At the 2013 Google+ Event Google+'s chief +Vic Gudotra dazzled us with G+'s capability to recognize and search for elements in photos without any text to guide it. For example, I can go in my G+ photo tab and search "Karyn beach" and get mostly photos of my wife, Karyn, at the seashore. Google+ uses facial recognition to identify photos with my wife in them, but the new bit is the ability of the software to recognize sand and sea and semantically link that with "beach." Take note of the hashtags that Google+ auto-generated at upper right. The #Twitter one is obvious, but where did #offline come from? That word isn't used anywhere in the post or even in the image. My best guess is that Google recognizes this is an "offline" capture of a normally "online" entity (a tweet). This is a unique opportunity, perhaps, to see the sort of "machine learning" Google is employing in the development of semantic search. In the past, Google's search algorithm determined which pages should rank for a given query by following a set of very complex, but fairly rigid and well-defined, set of rules. But now Google has set loose self-learning aspects in its algorithm. These portions of the algorithm are able to respond and adapt to information and relationships as it runs across them on the web. It can actually begin to infer relationships between things ("entities" in Google parlance) and measure the strength of those relationships in much the same way that we humans do. Hashtag relationships on Google+ are obviously being "leaned" by the search algorithm within Google+ as we, the users, create them and use them together. The algorithm not only learns which hashtags (and thereby topics) we think belong together, but how many of us think that way, how strongly, and how recently (relationships can change over time). Moreover, hashtag relationships could be playing a part in Google's desire to understand real people and the topics for which others acclaim them as experts. The "learning from humans" aspect of this reminds me of the fictional computer HAL 9000 created by Arthur C. Clarke for his 1968 science fiction novel (and the simultaneously-released Stanley Kubrick film) 2001: A Space Odyssey. When HAL begins killing crew members of the space ship "he" controls, astronaut Dave Bowman climbs inside his data banks and begins to shut HAL down. As memory segments are removed, we hear HAL regressing. His speech becomes slower and simpler. Finally, the computer recalls being instructed by a human professor, and begins to slowly sing the song, "Daisy, Daisy," the first song he ever learned. Obviously Arthur C. Clarke had foreseen a day when computers would actually learn from the humans with which they interact. That day is here. How Google+ is creating, using, attributing, and relating hashtags is certainly interesting, but what can we do with that knowledge? Find new, relevant connections. Those of us who have been on Google+ for some time know that our networks there become most powerful and useful when we discover, reach out to, and build relationships with other people who display talent, insight, and "attractiveness" in topics related to our own interests. Search hashtags of interest to you and look at the related posts displayed in Explore for new conversations and people with whom you might want to engage. Get content ideas. The related hashtags shown in Explore can provide serendipitous suggestions for new content you might want to create to share on Google+. Looking at #googleauthorship in Explore I see it is related to #contentmarketing. 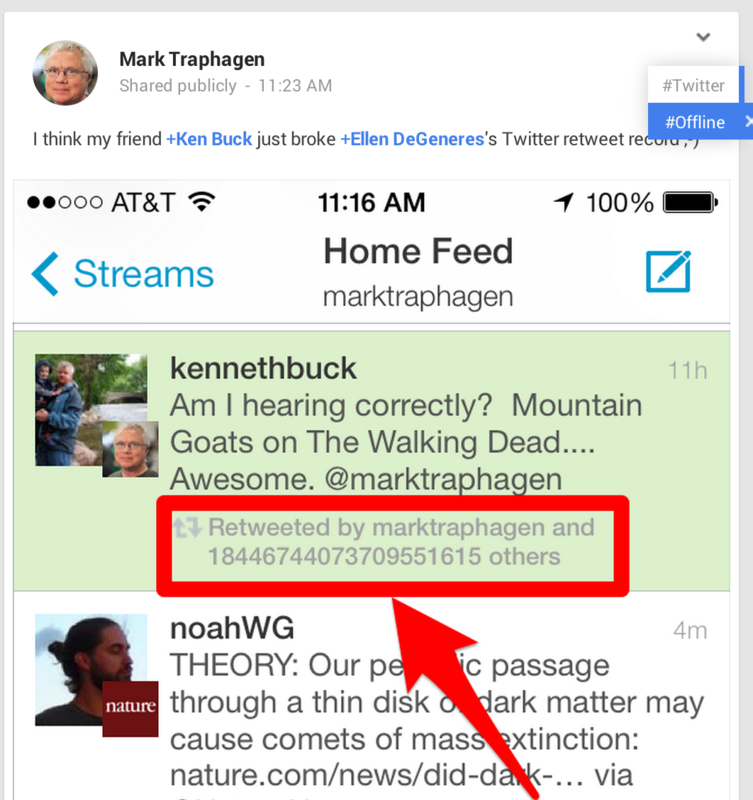 That might inspire me to write a piece about how Authorship contributes to a robust content marketing plan. Because real people are already associating these topics, the mashups created by related hashtags are a natural breeding ground for new ideas and writing topics. Those are a few ideas of my own. What about you? 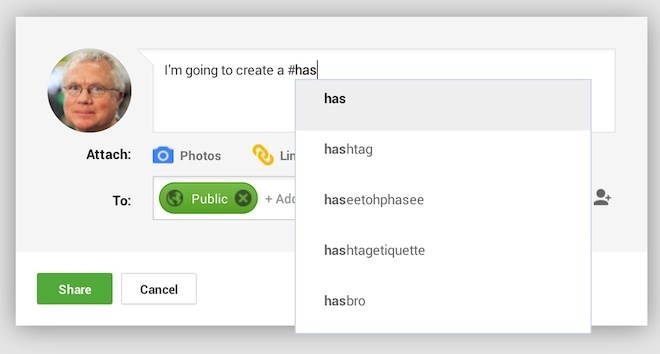 How might you make use of related hashtags on Google+?